Serena Jones has a passion for recovering lost and stolen art--one that's surpassed only by her zeal to uncover the truth about the art thief who murdered her grandfather. She's joined the FBI Art Crime Team with the secret hope that one of her cases will lead to his killer. Now, despite her mother's pleas to do something safer--like get married--Serena's learning how to g Serena Jones has a passion for recovering lost and stolen art--one that's surpassed only by her zeal to uncover the truth about the art thief who murdered her grandfather. She's joined the FBI Art Crime Team with the secret hope that one of her cases will lead to his killer. Now, despite her mother's pleas to do something safer--like get married--Serena's learning how to go undercover to catch thieves and black market traders. To ask other readers questions about A Fool and His Monet, please sign up. The library is going to do a blog about this series, but our blog writer doesn't want to spoil the books as she plans on reading them during her honeymoon! Can anyone give us a short description of the main characters? Are they witty? Charming? Too focused on a certain characteristic? Also this series is Christian Fiction; is it a clean read or does it focus on scripture and faith? Thank you! Wow. Gobsmacked is a good word for what I'm feeling right now. I initially wasn't super interested in this book, but saw some of my GR friends reading it, and it was free on Amazon kindle, so I thought, why not? And boy am I glad I did! This is pretty high up there with my favorite mystery series! For me, I find it especially hard to find clean, innocent, 'light-hearted' mysteries that suit my standard of "cleanliness". And this one totally did. I even handed it off to my little sister with no h Wow. Gobsmacked is a good word for what I'm feeling right now. I initially wasn't super interested in this book, but saw some of my GR friends reading it, and it was free on Amazon kindle, so I thought, why not? For me, I find it especially hard to find clean, innocent, 'light-hearted' mysteries that suit my standard of "cleanliness". And this one totally did. I even handed it off to my little sister with no hesitation. There wasn't anything overly violent, no sexual content, romance was EXTREMELY low-key, and there is zero swearing. I think what makes Orchard's novels is her fantastical characters. I know that's what made the book for me. Serena Jones, the MC, is completely unlike any other character or person I have ever known. With so many hilarious and endearing quirks and idiosyncrasies, I just couldn't get enough of her! Everything from her claustrophobia, to her ignorance of any romantic attention given her just makes her character so amazing. Even the secondary characters. Was there any cookie-cutter secondary characters for Orchard? No. From crazy Aunt Martha, to tough FBI agent Tanner, to apartment super Nate, to Zoe, head security at an art museum. All are so unique and fascinating. Sandra Orchard's writing style is the other thing that makes these books for me. Incredibly witty and hilarious in her dialogue and descriptions, I found myself in stitches more than once! I could happily lose myself in a million books like this one. She balances humor, action, and heartwarming story lines all in an intriguing, captivating way. All in all, I am so glad I picked this up, and can't wait to finish the series! I'd gladly recommend this to ages 14-15+. This one had me from the title...and then the cover was irresistible, too. I'm trying not to buy any more books for a couple of months to catch up on my to-be-read stack, but I requested this from the library and they bought the ebook the very day it came out (See how I get around my own rules? TBR stack still huge.)! So, naturally, I had to read it right away. I actually got to the end of this with my phone propped up on a chair while I ran a bunch of copies at work--it is hard to put down! I'l This one had me from the title...and then the cover was irresistible, too. I'm trying not to buy any more books for a couple of months to catch up on my to-be-read stack, but I requested this from the library and they bought the ebook the very day it came out (See how I get around my own rules? TBR stack still huge.)! So, naturally, I had to read it right away. I actually got to the end of this with my phone propped up on a chair while I ran a bunch of copies at work--it is hard to put down! I'll definitely be reading the rest of the series and have already recommended it to others. The writing style is easy to read and flows well, along with characters that pop off the page and a plot with more twists than a roller coaster. However Orchard managed to dream up such a complex crime I don't know, but I am impressed. Normally I can figure out the crime, but this one had me baffled. Serena is dealing with issues from her past...severe claustrophobia from watching her grandfather's murder from a secret passage is the first we encounter. She's a new FBI agent hoping to use her job and her art knowledge to finally solve her grandfather's cold case. She's still figuring out the job, trying to decide how paranoid she ought to be, trying to find her place in her new team and how she feels about her nice, protective, brusque partner Tanner. She isn't fearless, but she is brave, and she views life with a pleasant vein of humor. That was pretty good! Funny and exciting. I was annoyed by the love triangle/every guy in the world being into Serena even though she claims to be some forgotten old maid, though. SERIOUSLY. Is there a guy in this book that is not attracted to Serena? So tempted to rate it three stars just for that except it was super low-key and romance was not the focus. My favorite character was probably Serena's grandmother. She was just awesome. I actually didn't find her that anno That was pretty good! Funny and exciting. I'm definitely prefer Tanner over Nate if I must make a choice in another stupid love triangle which I don't give a monkey's pajamas about. Tanner is the obvious choice. He's awesome and relates to Serena's work. Nate is plainly just handsome and handsome and ... what else is he, really? Likes painting and old movies? Uh-uh. And ... that is all. Because I read this so long ago (well, a little over a month, but whatever) that I can't remember it, and reviewing is really falling to the side this year. “Serena Jones has a passion for recovering lost and stolen art--one that's surpassed only by her zeal to uncover the truth about the art thief who murdered her grandfather. She's joined the FBI Art Crime Team with the secret hope that one of her cases will lead to his killer. Now, despite her mother's pleas to do something safer--like get married--Serena's learning how to go undercover to catch thieves and black market traders. Series: Book #1 in the “Serena Jones Mystery” series. Review of Book #2 Here! *Note: the phase “guilty as sin” is said once. *Note: Mentions of actors, actresses, singers, & movies; Mentions of brands (Gucci, Prada, Armani, Boglioli, ); A mention of Sears; A mention of the Boy Scouts. *Note: A couple mentions of shirtless men; A mention of testosterone; A mention of a man zipping his pants after using the bathroom; A mention of a dead naked body (no details); A mention of a man paying attention to a woman’s curvy body; A mention of a “friendly” woman in a skimpy outfit; A mention of a long-legged woman. I loved the theme of art crime investigation. I liked the movie “Woman in Gold”, and while this was a little different side of things, it was along the same lines and pretty interesting. I got really happy when she was actually handling the art. Definitely made me want to study up on all the different artists! Serena was fun. Not your usual heroine (although, extraordinarily clueless? ), kinda a klutz, and pretty down-to-earth. Especially when talking to her cat or being jumpy. XD At least in this first book, I did like Aunt Martha. She reminded me a lot of someone I’ve known before, and it was fun when she was innocently curious and trying to help. (view spoiler)[And she was really helpful near the end. (hide spoiler)] :D Zoe was also a great side character. I think she’s actually the character I’m most like, to be honest. :D My favorite scene was when (view spoiler)[Serena got the head injury (hide spoiler)]. It was really realistic, a culmination of everyone’s fears actually, and the aftermath was really sweet. I actually didn’t enjoy the mystery that much, though. Because Serena herself was so scattered, I couldn’t do much theorizing which took some of the joy out of it for me. I like being the detective along with the book detective. It always blows my mind and thrills me when the author lets me in on things, then sweeps the rug out from under me with the “big reveal”. I almost felt as if, in this book, I was kept too much in the dark to enjoy the big reveal. There were also some pretty dark crimes I was uncomfortable with even being mentioned. I’m gonna mark them as a spoiler, so you don’t have to read them unless you want to. ;) Supposedly (view spoiler)[there are people on the loose who knock you out and steal your organs from you. Manny the Masher is rumored to literally smash you if don’t pay your debts. And then there’s a dirty adoption, which before Serena knows that’s why they sent the baby back, she wondered if it died under mysterious circumstances. I don’t want to even think about that. (hide spoiler)] Also, I was shocked and disturbed that the villain (view spoiler)[used and then murdered a mentally handicapped man. (hide spoiler)] Like I get that the villain is reeeeaaallly evil, especially after (view spoiler)[what happened with Cody, (hide spoiler)] but I picked this book up for entertainment. So I found that disturbing. This is the kind of book I would only read if it was on a free Kindle promotion, which it was. It was generally well-written and entertaining, and I liked the realistic, informative aspects of the FBI story element. I agree with previous reviewers that the infamous love triangle is unrealistic, contrived, and distracting - nothing but a cheesy device to dress up the story, as evidenced by the fact that the book closes with an opportunity for readers to vote on whom Serena will marry(!). 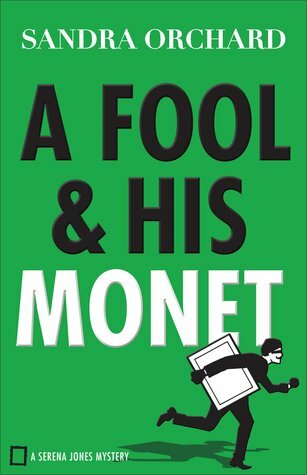 "A Fool a This is the kind of book I would only read if it was on a free Kindle promotion, which it was. It was generally well-written and entertaining, and I liked the realistic, informative aspects of the FBI story element. I agree with previous reviewers that the infamous love triangle is unrealistic, contrived, and distracting - nothing but a cheesy device to dress up the story, as evidenced by the fact that the book closes with an opportunity for readers to vote on whom Serena will marry(!). "A Fool and his Monet" is fairly clean, with the exception of a few thoughts Serena has about her multiple would-be boyfriends that I do not think should be spelled out. I found the plot confusing at times, but I was following along okay by the end and went away feeling like it made sense. As others have noted previously, Aunt Martha is indescribably over the top and irritating. It's been a long time since I read a contemporary book - I usually stick with 'dead authors' - and I was surprised by how much I enjoyed this. Christian without being shoehorned in or preachy. I guess people would probably characterize it more as 'religious' than Christian - because other a brief references to pray or being grateful to God or going to Church, not a lot of Christianity. But for me, Christianity in a book is a lot about what an author DOESN'T write about and this autho It's been a long time since I read a contemporary book - I usually stick with 'dead authors' - and I was surprised by how much I enjoyed this. Christian without being shoehorned in or preachy. I guess people would probably characterize it more as 'religious' than Christian - because other a brief references to pray or being grateful to God or going to Church, not a lot of Christianity. But for me, Christianity in a book is a lot about what an author DOESN'T write about and this authoress kept things much more clean than most 'Christian authors'. The story: Though I could get a little bit lost sometimes, this book was actually clearly written and really kept me guessing throughout. For the most part I was able to follow all the 'knowing that he knew that we knew what he knew' plot twists. And then it's about the FBI - what's not to like? - and that fact that it is about art recovery makes it even more fascinating. That's a sub-genre of thrillers that (I think?) is rarely delved into, plus as an artist, I found it cool. The Narrative: Though I felt like there could have been more 'voice' (sometimes it felt like a long recitation of every single step in Serena's investigative process - like a field agents report, than a field narrative) - still - it was quiet funny and easy to read. Serena: It was nice to read about a female FBI agent who was so human - instead of being an ice maiden, she is just a normal, intelligent person who has struggles and quirks like everyone else. And any parts where she had to fight where much more believable as well, none of that absurd "kick your teeth in" stuff - but more of her catching people off guard and relying on training and speed. Carmen: The sweet, surprising and sympathetic mafia guy. <3 <3 Hilarious and intriguing. Her Neighbors: I just wish there had been MORE about these quirky individuals. Her Family: I really had the feeling of 'seen this before' with the parents and aunt. Neither of the guys in the book have any faults. I really hate this 'perfect guy syndrome' - it's a lie. Nate conveniently pops up to make her heart race, get ride of mice, fix her tea, quote poetry and basically check all the boxes for "dream guy". I personally found him annoying to begin with and I kept getting more and more annoyed with him throughout. Tanner is a smidge better - at least we see him working and doing something with his life instead of living to for Serena - but again, other than being teasing, he doesn't have any faults either. Which brings me to the love triangle; didn't like it. I could have liked Serena's character more if there hadn't been constant comments from her friends like: "You have to beat off guys with a stick." And it was kind of true - random guys on a park bench had a romantic interest in her, basically. I would have preferred no romance AT ALL. For once, I would like to read a book where the main girl is content and focused and has an arc that doesn't involve a guy. She has only just begun her career as an agent, it seems a shame that she would give it up so quickly. I hope Serena remains an agent - for a long time. I hope she remains SINGLE - but since that isn't like to happen, I would have to pick Tanner. In Summary: I'm impatiently waiting for Book 2 to become available at my library! Wow! Is this the same author? I've also read Deadly Devotion by Sandra Orchard and found that suspense novel to be just o.k. Clearly, she has found her sweet spot in comedic mystery. A Fool and His Monet was super cute. Main character Serena Jones is an FBI Agent that specializes in art crimes. While solving the mystery was a strong part of the novel, the characters were even stronger. Serena's mom just wants her to be safe and get married. Serena's Aunt Martha is a hoot. She involves herself how Wow! Is this the same author? Main character Serena Jones is an FBI Agent that specializes in art crimes. While solving the mystery was a strong part of the novel, the characters were even stronger. Serena's mom just wants her to be safe and get married. Serena's Aunt Martha is a hoot. She involves herself how she can in solving crimes. And then there were the numerous men in Serena's life that could be viable mates for her. I love mystery's, so I was really happy when I had the chance to get one my friends had raved about so much. 1. Serena being an FBI agent made it super believable how she gets cases. And the way this author showed her job made it seem more real then how most people portray the FBI. 2. The mystery was well done. I only had a couple points that I had trouble following, but I caught on pretty quickly. 3. Nate, he was very nice. 4. The book was really clean. There are some things mention I love mystery's, so I was really happy when I had the chance to get one my friends had raved about so much. 4. The book was really clean. There are some things mentioned in passing, but they are so small that I really don't even notice them to much. 1. There was a lot of tension built all the time, and it always dissipated really fast. It was like nothing was ever really a reason to worry. 2. Her aunt. Goodness she was beyond annoying, and I thought she was a little over the top. 3. Everyone loves Serena. Every guy flirts with her, but she doesn't want to date. And for not wanting to date, she sure does hang out with guys a lot. I'm going to start with a disclaimer. This was not something I thought was really wrong with the book, just the more I thought about it, the more I laughed. Serena has four guys. Yes, four. Two that she likes, and two that like her. Since this is not a love triangle I have daubed it a love fan. We've got the hot FBI agent who is mysterious and super charming. We've got the pretty normal guy who suns her apartment, and he is swoon worthy to Serena. We've got the guy she jogs with who likes her. We've got her best friends cousin who was her childhood crush. All of which have some weird habits which might include watching Serena's apartment to make sure she's safe. Also they all trip over each other trying to keep her safe. Overall, this was a cute book, I liked the mystery. I am not a fan of the love-tringle (Or fan) element and the characters were not my favorite. If I am given the chance, I might finish the series, but I'm not sure yet. Campy and fun and chock-full of mystery -- an incredible beginning to a new series. And I just love this retro-style cover. Fits the book's ambiance to a T.
Serena has enough quirks to keep a reader smiling in the midst of an intense art theft investigation. The perfect blend of action, suspense and the hint of romantic entanglement...only, oh dear, there seem to be a number of eligible candidates. Time...and a few more books should set us straight on that score. And her family likes to stir thi Campy and fun and chock-full of mystery -- an incredible beginning to a new series. And I just love this retro-style cover. Fits the book's ambiance to a T.
And her family likes to stir things up a bit -- especially Aunt Martha who has an interesting past. Orchard hasn't shared it yet, but I'm betting on something knock-your-socks-off surprising. There's another character, Nate, who is much more than he seems -- I'm sure of it. Two subtle clues set my reader spidey senses on edge and I can't wait to see if I'm right. Another reason to anxiously await the next installment which comes out in September. Like most cozy mysteries, A Fool & His Monet is written in first person point of view. We're in Serena's headspace all the way. I know a lot of people don't like this POV, but I think it worked really well in this case. It's kind of fun to see everything through Serena's eyes only, including some interesting men who just might be thinking of her as more than a friend. And I could tell the author really did her research when it comes to police and FBI procedure and that results in a fascinating journey into the inner workings of an investigation. Honestly, I don't know how Orchard kept all the intricate nuances straight! Spectacularly done. Still, this is a splendid start to a promising new series -- witty, upbeat and full of the unexpected. Sweet perfection for the avid cozy mystery fan. A zippy, unique spin on the CBA mystery genre, Orchard uses her romantic suspense chops for lighter fare. An intriguing premise sees Serena Jones tackle the art world with two (or more ) eligible men in her near periphery. paintings from her best friend's museum. Should've been simple and effortless, but it becomes much more complicated than Serena anticipates and we end up with a great page turner with lots of humor mixed in! "Harold!" I strode to the bedroom and found the freeloader curled up in the middle of my bed. I scooped him up and carried him back with me to the kitchen. "Here's the deal. I ward off two-legged intruders. You handle the four-legged ones. Okay?" Harold meowed, but it didn't sound like he agreed. Too bad. I was trained to take down two-hundred-pound men, not two-ounce rodents. I held Harold up to the cupboard and gingerly opened the door. This is definitely Orchard's best book to date and NOT to be missed! Also, the author has included a survey on her website for readers to decide which of the two guys Serena should end up with for the series making this even MORE fun. Don't miss out, see where Serena's case leads her in this clean action story! From the very first chapter, Sandra Orchard immerses her readers into the action, and the atmosphere of suspense remains high throughout A Fool and His Monet. So does the humor. The first person POV allows readers not only to see the action solely from Serena’s perspective but also to peek inside the wry hilarity of her thoughts. The possible secrets surrounding both Great Aunt Martha & Nate - as well as the continuing arc of the cold case murder of Serena's grandfather add to the suspense - From the very first chapter, Sandra Orchard immerses her readers into the action, and the atmosphere of suspense remains high throughout A Fool and His Monet. So does the humor. The first person POV allows readers not only to see the action solely from Serena’s perspective but also to peek inside the wry hilarity of her thoughts. The possible secrets surrounding both Great Aunt Martha & Nate - as well as the continuing arc of the cold case murder of Serena's grandfather add to the suspense - and insure that readers will be waiting impatiently for book 2's arrival. Cozy mystery fans, don’t miss this new series by Sandra Orchard! It’s campy. It’s quirky. It’s full of opportunities to smile. You may even laugh out loud. A hint of a brewing love triangle, plus a bit of intrigue surrounding one of the potential beaus, will appeal to people who also like some romance with their sleuthing. Great-Aunt Martha is quite simply a hoot and will delight readers with her Jessica Fletcher-ing, while Serena wins them over with her endearing personality that’s full of wit and eccentricities. In fact, Serena Jones may be one of my favorite FBI agents to date because she feels real and human and like someone I would want as a friend. While A Fool and His Monet is lighter on the “Christian” and heavier on the “fiction” than most in the genre, sometimes – and in this case – I think that’s totally okay. I highly recommend this book to readers in both the Christian fiction and general fiction markets! This was my first read by Sandra Orchard, and I can tell you right now that it will not be my last! I loved this book! I was totally hooked from page one! It was such a fun ride, several moments had me on the edge of my seat, there was some sweet romance and I laughed my way through the book at the numerous funny scenes and lines! I really liked the main character, Serena. And I am not usually a fan of love triangles but I have to say that this one (Or I should say the start of this one!) was ju This was my first read by Sandra Orchard, and I can tell you right now that it will not be my last! I loved this book! I was totally hooked from page one! It was such a fun ride, several moments had me on the edge of my seat, there was some sweet romance and I laughed my way through the book at the numerous funny scenes and lines! I really liked the main character, Serena. And I am not usually a fan of love triangles but I have to say that this one (Or I should say the start of this one!) was just pure fun to read about, I can see the merits of both guys and look forward to learning more about them as the series progresses and I can't wait to see who Serena ends up with! This was such a unique story, I don't think I've ever before read about an FBI agent who specializes in finding stolen art, and I found Serena's job to be absolutely fascinating. Something else I loved was how Serena decided on a celebrity that each person in her life looks like, that was such a fun quirk of hers. Another quirky thing I loved about the book was Serena's sleuthing, mystery-loving Aunt Martha, she was just so great, yes some of her theories were outlandish but I loved that Serena actually listened to her at times and discovered things she may not have thought to try in working on solving the case! I am a pretty observant reader so few things usually surprise me, but I will say that there were several twists in this book that totally took me by surprise, I loved that! Overall, I loved this book and I highly recommend it! I am so glad that I read it and I very much look forward to reading the next book in the series! I was honored to receive a review copy of this amazing book from Revell publishers in exchange for my honest review! I'm in a minority here, but I couldn't get into the book. The characters are quirky, which always makes for entertaining reading, but I was very easily distracted with this book. I frequently found myself putting it down and not coming back to it. Still, I enjoyed the mystery part of the book. I enjoy mysteries. But I'm not sure on the whole love triangle thing. When book 2 comes out, I might give it a try, but I might not too. I received this book for free from Revell Books for the purpose of revi I'm in a minority here, but I couldn't get into the book. The characters are quirky, which always makes for entertaining reading, but I was very easily distracted with this book. I frequently found myself putting it down and not coming back to it. I received this book for free from Revell Books for the purpose of reviewing. I was not required to like the book, only give my honest opinion. My thoughts and opinions are my own. I read book three, and decided I absolutely had to read book one. I enjoyed Sandra Orchard’s writing for this book. At times, it seemed a little shallow, but for just a light-hearted read with a few laughs, this is exactly what I wanted. I love the FBI side. And unlike some mystery books I’ve read, this one wasn’t dark. Yes, there were murders, and they weren’t made light of, but the mood of the book wasn’t depressing at all. Reading this as a writer, I have to admire the character depth that Ms. I read book three, and decided I absolutely had to read book one. I enjoyed Sandra Orchard’s writing for this book. At times, it seemed a little shallow, but for just a light-hearted read with a few laughs, this is exactly what I wanted. Reading this as a writer, I have to admire the character depth that Ms. Orchard gives. All of the characters—good, bad, and “in between”—were well thought-out and had their individual personalities. Romance—there is a love triangle (as I think I mentioned in book three—so apparently this love triangle lasts the full series). Serena is beginning to feel emotions towards two different men, but nothing obsessive or overboard. She’s actually kind of clueless. Christianity…as much as I enjoy the style and cleanness of this series, it really doesn’t come across as a solid, Christian book. God is mentioned, going to church is mentioned, but that is about the extent of Christianity. Serena Jones is an FBI Agent working in the art crimes area. She has been an agent for about a year and still works closely with her mentor, Tanner. Her best friend is in charge of security at the local art museum in St. Louis and makes a startling discovery. Two paintings have gone missing from inventory, but no one knows just when the paintings were stolen. Serena takes on the case and begins questioning all the museum employees. She sets her eyes on a particular suspect and soon thereafter events begin to get more personal and escalate. As her investigation leads her to a John Doe in a local morgue, she also is dealing with her mother and aunt who are trying to get her married off. Tanner and the superintendent in her apartment building, Nate, are two potential suitors that Serena kind of likes, but isn’t interested in getting married right now. She is focused on her job. She also has the ever-present task she has assigned herself of finding her grandfather’s missing painting and the person who murdered him to get it. That is why she became an agent. This was an interesting mystery that I couldn’t put down. From the clever title to likeable characters to an intriguing plot, this story is a winner! I just loved Aunt Martha! She was a great addition to the story for comedy relief. She was well intentioned and actually had some good thoughts on Serena’s case every once in a while. I liked that Serena was tough, but willing to accept help. She is a loving daughter and values her family. There is potential romance in the air that I hope develops more in book two that will be released this fall, so look here for my review. This is a great start to a new series!! Oh. My. Word. Where do I even start? For once, I didn't read the reviews before I started this book, so I had no idea what I was getting into. Honestly, when I pick up a free FBI-mystery novel off a promotion, "hilarious" is about the last word on my list of expectations. But this book was just that. Entirely hilarious. I was in stitches for almost the whole book as I watched the antics of the whole gang of quirky characters revolving around Serena (who's pretty quirky herself) as she tries to tra Oh. My. Word. Where do I even start? But this book was just that. Entirely hilarious. I was in stitches for almost the whole book as I watched the antics of the whole gang of quirky characters revolving around Serena (who's pretty quirky herself) as she tries to track down the truth behind a theft from a local art museum. The mystery itself had plenty of twists and turns that I didn't expect. I'll admit that I don't have a very good track record in that area, so that doesn't necessarily say much, but I'm guessing even bigger mystery buffs than I am would have a hard time figuring this one out. Things did get a little more serious at times as the trail led from simple theft to murder, but there were times I almost forgot the mystery as Serena tried to make her cat deal with an invading mouse or fend off her mother's attempts at matchmaking or rein in amateur-sleuth Aunt Martha. Oh, my word, Aunt Martha! That woman was something else and then some! Honestly, there were no boring characters in this book, but Aunt Martha takes the cake! And for once in my life, I'm seriously conflicted on a love triangle (okay, at this point more of an interest triangle). But I adore both of these guys--how am I supposed to choose? Let's just say that whichever one doesn't end up with Serena better find another seriously nice girl! I generally don't read a lot of mysteries that aren't meant for kids, because I don't like violence at all. This book had some violence, but it was kept to a minimum, or at least the details were, so that was nice. This book made me roll my eyes quite a bit because of being cheesy, and there was some stuff I didn't appreciate, but for the most part, it was a nice, kinda laidback type mystery. I enjoyed it and might read another book by the same author in the future, although I wouldn't count on I generally don't read a lot of mysteries that aren't meant for kids, because I don't like violence at all. This book had some violence, but it was kept to a minimum, or at least the details were, so that was nice. This is one of those books that you could TOTALLY see being made for Hallmark Movies & Mysteries or a fun sitcom series. Our heroine was a delight to get to know. Serious, about her work, fun (but doesn't know it), and someone you'd want to be friends with and follow around to see what will happen next in her crazy life. She is surrounded by a delightful and quirky family, loyal friends, and too many male devotees to count. There does seem to be two men in particular that both have their site This is one of those books that you could TOTALLY see being made for Hallmark Movies & Mysteries or a fun sitcom series. Our heroine was a delight to get to know. Serious, about her work, fun (but doesn't know it), and someone you'd want to be friends with and follow around to see what will happen next in her crazy life. She is surrounded by a delightful and quirky family, loyal friends, and too many male devotees to count. There does seem to be two men in particular that both have their sites on the prize of Serena Miller. I am casting my vote based on the way the author wrote them as to which way I am leaning in this love triangle. I am told that the mystery of who wins her heart is in book three of this series. Squee! The mystery in this book was complex and there were a lot of dead ends to arrive at before the art thieves are revealed. The author did significant research on the art world and the museums that house them. Really well done! I'm not usually a fan of mysteries as the first person narrative coupled with the humour can be overdone and I find it annoying, but this particular book came highly recommended from a friend (Thanks, Staci!) and as it was only 49p I decided to try it. I'm so glad I did, and now I have the next 2 on my wish list. I loved Aunt Martha - what a great character she is...although if she were my aunt I think she might drive me a bit crazy too! Serena has a habit of relating people to f A delightful read! Serena has a habit of relating people to film characters and I found Tanner's ways of trying to find out which film character he reminded her of rather amusing. I liked the fact British food made it's way into this story. Oh, and I'm totally with Serena on the Bubble and Squeak. I don't like it either! I don't like that there are 2 people I like (Nate & Tanner) who seem to be interested in Serena. That means one is going to be disappointed. *Sigh*. I just hope Sandra Orchard has someone very nice lined up for the one who doesn't get her, or that one loses interest in her before the end of the series. At this point, I'm not sure who I want her to end up with. There would be a scene with Nate, and I'd think Yes, I definitely want him to end up with Serena, but then there would be one with Tanner and I'd think Hmm, actually, those two would be a good match, maybe I want you two to be together! A great mystery with humour nicely woven into the tale, and lightly sprinkled with romance. I liked this book so much I immediately got the second one. The central mystery begins w Serena Jones is the youngest member of the FBI Art Crime Unit. She is on her first undercover assignment as the novel begins, and what could be a serious and seriously boring story is anything but. Serena is smart, a bit sassy, claustrophobic, and a great choice for narrator. She's a knowledgeable and capable agent, who is surprising bad at keeping the details of her life, and work, from her friends and family. And that is part of what makes this mystery so much fun. A secondary mystery is one that I am sure will be a thread through the series, the murder of Serena's grandfather and theft of his painting. Another thread will undoubtedly be Serena's romantic prospects, her family's meddling in them, and possibly her slow descent into being a bit of a cat-lady. I liked the touch of having her parents be British and I adored her Aunt Martha, a feisty old lady who just can't keep out of the case. Special Agent Serena Jones is trying to calm her jittery nerves following a painting recovery when she receives a paniced call from her best friend. Two valuable paintings are missing from the storage vault at the museum her friend works for. Serena dives headfirst into the mystery. Getting the paintings back to the museum turns out to be a tall order. The trail is months cold, and Serena has big distractions--like a stalker who might be trying to take her out and a slew of guys trying to impres Special Agent Serena Jones is trying to calm her jittery nerves following a painting recovery when she receives a paniced call from her best friend. Two valuable paintings are missing from the storage vault at the museum her friend works for. Serena dives headfirst into the mystery. Getting the paintings back to the museum turns out to be a tall order. The trail is months cold, and Serena has big distractions--like a stalker who might be trying to take her out and a slew of guys trying to impress her. I purchased this book on a whim. Usually I dismiss anything art related, but I recently spent a week going to museums with a friend of mine who loves art. After several days of geek outs over Degas, Monet, and Van Gogh, I couldn't help but noticed this book at a local homeschool conference. It took me a chapter or two to orient myself when I started reading. I don't read a ton of mysteries, and at first I wasn't sure what to make of Serena's quirky commentary on life. Turns out, it's Serena's unique perspectives that make this story delightful. She's kickbutt without ever being obvious about it, observant, and delightful clueless about guys. Her novels have garnered numerous a Sandra leaps off the garden trails of her herbal-researcher-turned-amateur-sleuth (Port Aster Secrets) series, to the museum corridors of her plucky FBI art crime agent Serena Jones, in A Fool and His Monet.